I prefer not to give blog space to ginned up controversies over fake political issues, but I have to say: an awful lot of white Americans confuse sticking their head in the sand with patriotism. My introduction to the Colin Kaepernick brou-ha-ha came at the gym, when I parked myself on an elliptical machine across the way from a CNN broadcast. Onscreen was Jake Tapper, formerly a real journalist at Salon.com, who asked the mother of a dead war veteran what she thought of Kaepernick refusing to rise for the national anthem in protest of the oppression of black Americans. Even as I sympathized with the woman being interviewed—what can be more painful than losing a child?—the wall-to-wall phoniness of the media moment was galling. 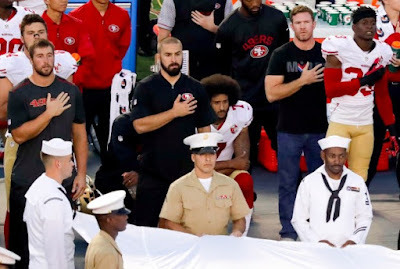 What could have been a long overdue discussion of race in America was instead the cheap spectacle of an overpaid TV personality wearing a pasted-on earnest expression as he asked a grieving mother just how offended her sense of patriotism was by Kaepernick's quiet act of civil disobedience. Sadly, this is what passes for much of the political discourse around race in the United States. 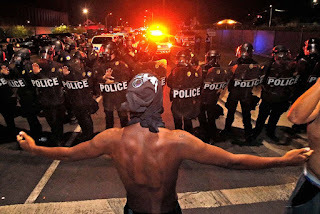 A white, highly privileged class of media figures frame race issues in a false binary, giving equal credence to the concrete information, real world experiences, and historical context cited by #Blacklivesmatter and the subjective, often subrational views of a white majority who back cops unconditionally and get upset over the occasional lack of compliance with empty rituals—usually because they have never personally experienced discrimination. Faced with this level of denial, in which one side of the debate has such a poor grasp of the details, we can't have much of a dialogue. The facts about police discrimination toward black Americans are crystal clear. According to publicly available studies, blacks are more likely to be harassed by the police, pulled over without just cause, searched when they're pulled over, handcuffed, arrested and detained, met with physical force, shot, and fatally wounded when not posing a threat. crimes, particularly when it comes to drug offenses. Time in the legal system increases employment discrimination against blacks and sometimes robs them of the right to vote, either outright, through laws that prohibit felons from casting a ballot, or through onerous voter ID measures strategically passed by Republican state legislatures in order to lower Democratic voter participation. African-Americans who steer clear of legal problems face discrimination in the acquisition of healthcare, talk therapy, education, housing, loans, and numerous other less consequential but still humiliating ways, from being followed through grocery stores to being treated as less-than in everyday interactions to being unable to get a cab in major American cities. Institutional and societal racism exacerbate a grinding poverty tied to America’s ugly past. Sociologists, psychologists, and anyone who understands history knows that a people who have been systematically subjugated for centuries are less likely to develop the tools to raise themselves up by the bootstraps. The United States tried to address this problem in Lyndon Johnson's War on Poverty, but these efforts were undermined by the Republican Party, which has exploited white America's stone cold ignorance and bizarre feelings of racial grievance ever since passage of the Civil Rights Act to win elections and gut social services that lend a hand up. In a just world, Colin Kaepernick would receive applause for using his celebrity to bring attention to this shameful situation. In a future, more enlightened America, populated by a higher concentration of people of color, a higher proportion of Millennials, and fewer elderly and middle-aged whites with fossilized racial attitudes, Kaepernick's cause may get the hearing it deserves. But in today's America, his message is falling on deaf ears. Such is life in the United States of Amnesia.